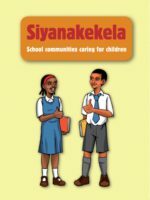 Siyanakekela (“We care”) ran in 15 schools in the Nqutu and Endumeni areas in KwaZulu-Natal (KZN). It was implemented jointly by the KZN Department of Education, the David Rattray Foundation and MIET AFRICA. Siyanakekela was used to test a model of school community partnership: it aimed at building the capacity of both schools and their communities to engage in identifying social barriers to learning and finding solutions for care and support for vulnerable children. Local municipalities were encouraged to coordinate collaborative efforts among local government to provide essential services to vulnerable learners and their families. Siyanakekela was funded by the DG Murray Trust.